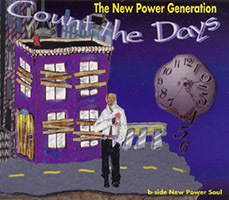 Count The Days was the third and final single to be released from the album Exodus, by the New Power Generation, released in the UK and Europe only. The single contained a "clean edit" of the track, with instrumental fills overdubbed onto the song's curse words. The b-side, New Power Soul, was also taken from Exodus. This single wasn't released in 7" format. This single wasn't released in 12" format. This single wasn't released in digital format. This page was last modified on 24 November 2017, at 14:02.